We’ve got some more airbrush heat coming straight at you, this time courtesy of M.T.B. Surfboards. M.T.B. stands for Mulhern, Takayama and Brumett. Most of the M.T.B. Surfboards I see are located in Florida, which is where I think Mulhern was based. I personally haven’t seen very many Donald Takayama-shaped M.T.B. Surfboards, but I don’t know why that’s the case. Much like the 80s Stussy surfboard above, the bottom of the M.T.B. board doesn’t look great. As of the time of this post, the bidding was still under $200. First of all, I love Mike Eaton’s surfboards, from his Bonzers to just about everything else he’s done. Second, Eaton’s surfboards commonly feature airbrushes by a particular artist, or at least very much influenced by that person’s style. I have never found any information online about who airbrushes Eaton’s boards, but I really dig them. See below for an example of a Bing board with a very similar airbrush, which I imagine was likely shaped by Eaton as well. I think the Mike Eaton surfboard is a little pricey at $800, but it is absolutely gorgeous. Shredderz, it might be a brand New Year, but it’s the same old program as far as Shred Sledz is concerned: nothing but vintage sticks and tasty waves. As always, here’s a rundown of some of the cooler boards I’ve seen posted for sale this weekend, including some nice Mike Eaton gems, in honor of the most recent Sagas of Shred post that featured an old Eaton Surfboards brochure. Anyway, enough talk, and onto the boards! Here’s an interesting example of an Eaton Zinger, complete with a great shot of the tail that shows the insanely deep concave and the unusual quad fin Zinger setup. The seller says the board is an Eaton UEO outline. This particular board is a collaboration with San Diego shaper Joe Bauguess, who claims to have invented the Mini Simmons. Judging from Bauguess’ Instagram account, he has continued to experiment with super deep concaves and the Zinger setup. The seller is asking $775. This might be a tad on the steep side, but for what it’s worth, I have never seen an Eaton / Bauguess board before. Yes, another example of a Mike Eaton surfboard! This here is a more standard looking twin fin, and I don’t see any of Eaton’s trademark ultra deep concave, nor is there a bonzer fin setup. The seller is asking $399. This is the same board featured at the top of the page. I’m a sucker for any Seventies single fin with a beautiful coke bottle blue glass job, and this one fits the bill. I love the subtle red resin pinline on the deck, too. Ryan is a long time shaper from the South Bay of Los Angeles. I don’t know if Pat is still shaping, but it looks like his website is still up and running. This board costs $325. I think that’s about fair, but I haven’t seen it in person. Here’s a pretty clean Stussy thruster that has been for sale on eBay for a few weeks now. I’m a little surprised no one has pounced on this board at what I would call a reasonable $750. I guess it’s a different story if you’re paying for shipping, and the board is located all the way down in Florida, but still! I’m wondering if the relatively plain paint job is keeping the price down. Thanks for reading and tune in next week for some more vintage surfboard goodness! While Shred Sledz predominantly focuses on vintage surfboards, there are many modern surfboards that are also deserving of attention. I have written up Shawn Stussy‘s vintage boards many times before, but have paid comparatively little attention to his new label, S/Double. Part of this is because of the aforementioned focus on vintage boards, combined with my love for Stussy’s earlier work, like his stint at Russell Surfboards, and the boards made in the Eighties under his own name. There are few surfboards I would like to add to my quiver more than a Stussy S/Double. Like Skip Frye’s surfboards, it’s not possible to simply call up Señor Stussy and have him whip something up in a few months’ time. As a result, I keep an eye peeled for the rare occasions when S/Double surfboards pop up for sale on the secondary market. The board pictured above is an S/Double single fin that was posted for sale on Craigslist in Orange County earlier this month. The board is not mine and all pics in this post are via the original listing, which has since been taken down. The board measures 6’5″ x 21″ and it was glassed by the talented folks at the Waterman’s Guild. I love the clean lines of this board and the restrained color palette. The incredible appearance shouldn’t come as a surprise to anyone, given Stussy’s well-documented career as a designer and the equally regarded work of the Waterman’s Guild. The board is a Stussy shape, so you know the logos and the details are all going to be on point. I’m not sure if “Swingin’ Single” is an official model or just a catchy name, but either way, I’m into it. The signature has all the flair you’d expect, and I love the handwritten description of the board and its dimensions. In the original listing, the seller claims he purchased the board from Shawn Stussy himself. Apparently the board was never ridden, either. It’s clear from the photos that the board is in absolutely pristine condition. The original asking price was $1,500. I don’t have much basis for comparison, given how few S/Double boards publicly change hands. On one hand, $1,500 is a lot for a surfboard, even if it is brand spanking new and has a beautiful glass job like the Stussy S/Double board featured above. But as we all know, the combination of scarcity and cool has a way of driving up prices past the limits of logic. And if you’re not one for talking about prices, at the end of the day, the board above is a beautiful surfboard shaped by one of the most culturally influential figures to ever pick up a planer, and that’s always worth checking out. Greetings, Shredderz! Today’s Sagas of Shred entry — in which I scan an old surf magazine ad and write a bit about it — builds upon yesterday’s Blue Hawaii Pottz Pro Model post. As you can see in the photo above, it’s an advertisement for Pottz’s line of signature models shaped under the Blue Hawaii brand, but with a couple of very interesting twists. First, I wrote a separate Sagas of Shred post a few months back that featured the Blue Hawaii Pottz Pro Model, which you can find here. The ad above — which originally ran in May 1991 issue of Surfing Magazine (Vol 27, No 5) — features a quad fin variant of the Pottz board. Gone is the flame spray along the rails, replaced by a twinzer fin setup, what I guess you would call a bat tail, and then some interesting concave out of the back. Glenn Minami shaped many boards for Martin Potter, starting at Town & Country during its early days, and then going on to found Blue Hawaii. The ad above, however, clearly features Wil Jobson, the shaper credited with inventing the twinzer fin setup. Close up of a Blue Hawaii Pottz twinzer. This board was shaped by Stuart D’Arcy. Pic via Swellnet. Swellnet wrote up a post on Wil Jobson and the twinzer, and they also included this awesome close up of the business end of one of the Blue Hawaii / Pottz twinzer boards. The Swellnet board, however, was shaped by Stuart D’Arcy, and not Jobson. When you compare the Swellnet board above with the one featured in the Blue Hawaii ad, you’ll notice some key differences. First, the Blue Hawaii board has a different shape in the tail, and what looks like only two channels, versus the four in the Swellnet board above. However, both boards have the smaller twinzer stabilizing fins, which, according to Swellnet, are called canards. Business end of a Shawn Stussy shaped personal rider. This board looks very similar to the board featured in the Blue Hawaii ad, down to the channels and the bat tail. And you know I love the logos on the glass-on fins! And because here at Shred Sledz we celebrate Shawn Stussy’s entire catalog, of course we had to mention the board featured above. That board you see in the photo is a Shawn Stussy shaped personal rider that was apparently inspired by Jobson himself. The Stussy twinzer was sold at last year’s California Gold Surfboard Auction. Now, I know that Stussy shaped boards for Michael Tomson, who was CEO of Gotcha. Gotcha, in turn, was Pottz’s longtime clothing sponsor. Is it possible that somewhere in this mix Stussy got the idea to shape the twinzer pictured above? I can’t say for sure, but it certainly would be cool if that turned out to be the case. Thanks for checking out Sagas of Shred and tune in next Thursday evening, California time, for more vintage surf ads. Here’s a little Shred Sledz trivia for you: any time I see a rad Stussy board posted for sale online, I have to write about it. (For another awesome Stussy board, check out this thruster he made for Michael Tomson, the founder and CEO of Gotcha.) Sorry, those are the rules, and I’m afraid there are no exceptions. Recently I saw this super rad Stussy twin fin pop up for sale on Craigslist in Orange County. You can find the listing for the board here. All pics in the post are via Craigslist and the board is not mine. I’ve made no secret of my admiration for Stussy’s surfboards, and the board above hopefully makes it clear why I go so crazy over these shapes. The Stussy twin fin has all the bells and whistles you could want out of one of these boards. It measures in at a tidy 5’8″ x 20″ x 2 3/4″, and the serial number is 703. The board isn’t dated but I would guess somewhere in the early to mid Eighties. First, I absolutely love the airbrush. Generally speaking, if it was made in the Eighties and it has bright colors, I’m game. That said, Stussy’s boards from this era might fit into the overall aesthetic of the decade, but from an artistic standpoint, Stussy’s airbrushes are light years ahead of the standard fluoro spray job. It may sound obvious, stupid even, but the dude is a true artist, and I don’t think it’s an exaggeration to say that Stussy’s boards are pieces of art. Aside from the airbrush on the deck, there are a ton of other aesthetic flourishes on the Stussy twin fin that I can’t get enough of. First, I love the fact the Stussy logo has different colors on the deck and the bottom. The seller hasn’t provided great pics of the little laminates throughout the board, but you can see a small “Equipment for the Modern Age” hit on the bottom, just beneath the main logo. I also spy some artwork on the glass on fins, but I can’t tell what they are. I’ve said it many times before, but one of my favorite things about Stussy boards is how small logos and pieces of hand drawn artwork are scattered throughout. Picture from a different Stussy thruster that was listed for sale on eBay a while back. I love the logos on the glass on fins. The Stussy twin fin featured here is pretty well preserved, but there are some things worth mentioning. You can see there’s a big delam spot on the deck near the tail, to the left of the stringer. The bottom has a bunch of little nicks and dings on it, too. More than anything else, I just can’t believe that whoever owned this thing didn’t take better care of it. It’s like the Indiana Jones line whenever he sees a priceless artifact in the wrong hands: “It belongs in a museum!” The seller is asking $500 for the board. Perhaps this says more about my love for Stussy boards than anything else, but I don’t think that price is crazy. If this board were in better condition — a big if, I know — I could see it fetching multiples of that price. But it’s not, and fixing this thing up would require a decent amount of work. Either way, it’s a beautiful board, and I hope it finds a happy new home. Check out the Stussy twin fin for sale on Craigslist here. Greetings, Shredderz! The board I’m writing up today is one of the coolest I have ever seen. By now some readers might know that Shawn Stussy is a favorite of this humble vintage surfboard blog. Stussy’s Eighties thrusters are likely his most popular shapes, and for good reason. But what makes this Shawn Stussy thruster special is the fact it was shaped for none other than Gotcha founder Michael Tomson. First and foremost, a big shout out to Rob, who owns the board above, for sharing the photos you see in this post. He’s on Instagram here. Anyway, back to the board in question. By now we all know Shawn Stussy’s legacy as a renowned surfboard shaper and an early streetwear pioneer. But early on, Michael Tomson looked to be on the exact same trajectory, having transitioned from a pro surfing career to founding Gotcha, which was one of the hottest labels in surfing during its heyday. It’s also worth noting that Tomson ripped. 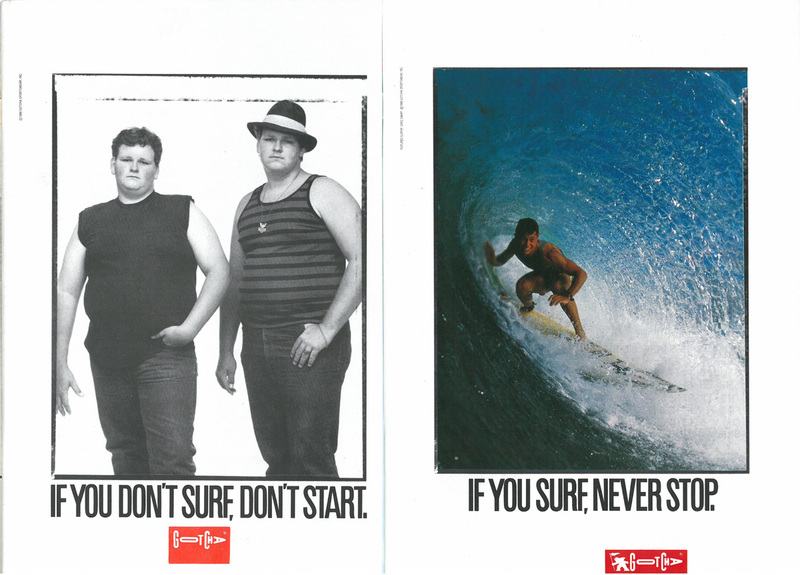 Sadly, Gotcha no longer exists today, but at one point the label was producing some truly interesting work, including the legendary “If you don’t surf…don’t start” ad campaign. More importantly, Gotcha’s early logo was actually designed by Shawn Stussy! As you can see from the Instagram post above, Stussy and Tomson’s history goes back to the early Eighties. This isn’t totally surprising, given Stussy’s Laguna Beach roots, which also was home to Gotcha’s offices. Example of another Gotcha ad, this one plucked from Tomson’s own website. My guess is this ad was late Eighties / early Nineties but I’m not sure. Befitting Gotcha’s raw, in your face style, Tomson was one of the most outrageous characters on the surf scene at the time. Sadly, Tomson’s hard charging lifestyle has lost a considerable amount of its romance, given Gotcha’s eventual fade and a string of drug arrests that occurred well into middle age. I love the fact this surfboard was not only shaped by Stussy, but also created for a true character who happened to be a world class surfer. And even if you don’t care about Tomson’s colorful history, well, at the end of the day, the board is still a Stussy thruster, with all the details and flourishes that make his boards so collectible. Of course, the board wouldn’t be complete without a Gotcha logo — beneath the glass, naturally. You can also see an additional Stussy signature on the deck right above the tail. What really gets me going are the awesome hand drawn logos found on the Stussy thruster. The planer laminate is one I don’t believe I have seen on any other Stussy boards. And how cool is that Stussy Team laminate?! That must have been the ultimate Eighties surfing street cred accessory. I love the touch of having the logo on the glass on fins, too — I wish more shapers did this nowadays. You might be wondering what kind of psycho writes five hundred plus words about an Eighties surfboard. Well, I regret nothing, because this Stussy thruster shaped for Michael Tomson is an absolute gem. Thanks again to Rob for generously sharing the pics of the board — you can follow him on Instagram here. Greetings, Shredderz! Today we’ll be looking at a selection of some of the most prized sticks in any would-be collector’s sights: Eighties Stussy boards. Shawn Stussy is best known for his clothing label, but before he became one of the godfathers of streetwear, he made a name for himself as one of the better shapers in Southern California. Stussy continues to shape today under his S/Double label. But given this is a vintage surfboard blog, it is Stussy’s earlier designs — both at Russell Surfboards and under his own name — that really get pulses going over at Shred Sledz HQ. Recently, a trio of Eighties Stussy boards went for sale on eBay, and here’s a rundown of the pricing and the condition of the various boards. The Stussy QZ/3 pictured above has all the bells and whistles you might want from an 80s Stussy board. Stussy’s shapes often feel like treasure hunts — there are always cool little graphics and details to be discovered if you look closely enough. I personally love the laminate on the glass-on fins, and what I like to think of as a laser show airbrush on the deck of the board. However, I am wondering if the board pictured above wasn’t re-finished, at least on the bottom. I don’t know why there’s a cutout around the signature, but it sure looks as if the yellow paint on the bottom was an after market addition. That would also explain the relatively low price — the board sold for $280, which is practically unheard of for Eighties Stussy boards. Please forgive the lighting on the pics, which are all via the eBay listing linked above. This board isn’t in phenomenal condition. It has a bit of a tan and there are some huge old traction pads on both the tail and the middle of the board. Nonetheless, I am drawn to a unique detail on this board, which is the neon Brotherhood logo located directly beneath the Stussy laminate. It’s far more common to see references to The Brotherhood on old Russell boards. The board has a lot of the thoughtful touches you’ll find on Eighties Stussy boards. I love the little “SS” laminate right above the fins, and Stussy even finds ways to make his signatures look cool. The Brotherhood logo board is being offered at $400, and a few days into the auction, there are no bites. Here we have another example of a Stussy QZ / 3 thruster. The QZ / 3 was a model name that Stussy used for a thruster-based design. You can find a tiny bit more context on Board Collector, along with some cool pics of some other Stussy shapes. Sadly, #2373 has seen better days. The board is being offered at $350.